We are members of the General Federation of Women’s Clubs, an international organization. Our club has over 50 members whose purpose is for the advancement of education and charitable work, to develop a higher spirit of service, and to create an organized center of thought and action among the women of Lakeland. We provide cultural, financial, and ecological programs for our members as well as service to our community. 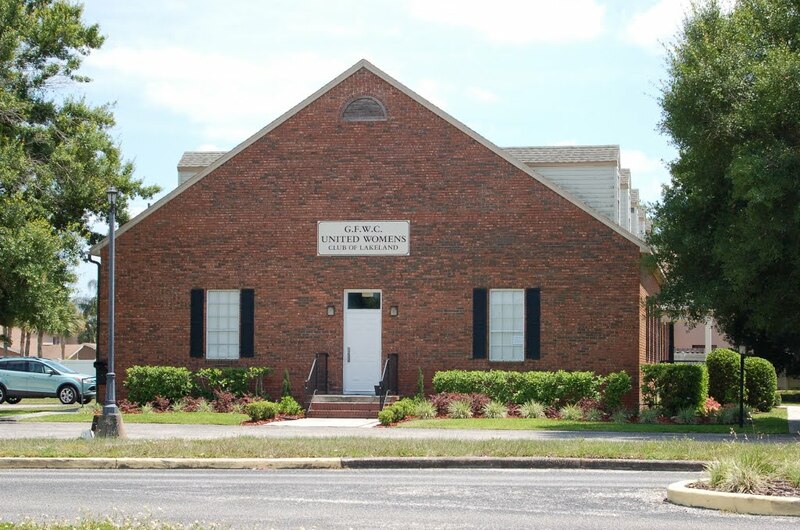 Today’s GFWC United Women’s Club of Lakeland was formed by the 1986 merger of Woman’s Club of Lakeland, federated in 1912; and the Sorosis Club federated in 1922. The original clubhouse was at 59 Lake Morton Drive; Sorosis was a few doors away. Before the merger, both clubhouses were sold. The new United Women’s Club of Lakeland had 243 members. General meetings were held at the Civic Center. Departments met in churches and private clubhouses. In 1992, a committee was named to find a site for a new clubhouse and to oversee construction – consisting of President Ronnie Sandell, and past presidents, Toni Bagley, Esther Harmon, Kathy Harrison, Ellen West and JoanYoung. The Williamsburg Square site was purchased in April, 1993; ground was broken on May 6, 1993. Heritage Homes of Polk County, the debt free, 5,000 square foot brick clubhouse was dedicated April 17, 1994. Attending were 160 members and guests. A reception followed with members serving refreshments.” A new Baldwin piano was the gift of an anonymous member. A major accomplishment is the debt-free clubhouse; but, we always remember that we are a service club, our principal reason for existing. The clubhouse is used for all General and Junior Club functions, for some District 9 meetings, also GFWC Florida Summer Planning and GFWC Fall Tour. It is rented frequently for wedding receptions and other private parties by members and non-members. We have fundraisers during the year to help support several charities. Amongthem are: Salvation Army, Catholic Charities, Special Olympics, American Red Cross, Child Development Center, Hacienda Girls’ Ranch (a home for non-delinquent, abused or abandoned girls), R.O.C.K. Camp (a free camping experience for children withcancer), Boggy Creek Camp (a free camp for children with serious heart conditions), Canine Companions, Good Shepherd Hospice, March of Dimes, Talbot House Free Clinic, LVIM (Lakeland Volunteers in Medicine) a free clinic for those with no medical insurance and VISTE (Volunteers in Service to the Elderly). These donations are also financed by other fundraisers – fashion shows, bridge parties and food sales. Our members are always seeking new and better ideas to raise funds. We are well represented at District and State meetings, having furnished many officers for both groups. Two of our members have served as GFWC Florida Presidents, Mrs. H. C. Glover in 1962 and Mrs. Braxton Bright in 1992.